On the Internet, we can find many initiatives focused on the heritage of cities. This varies from Facebook groups with a historic focus to local city blogs and memory websites. Furthermore, heritage organisations increasingly use online media to crowdsource material related to the urban past. Such participatory heritage websites give access to the past of cities and enhance the public’s engagement with urban heritage. In this project, I studied how these participatory heritage websites are used, examined their sociocultural impact, and explored under which conditions they work best. Furthermore, I assessed what the content of these websites tells us about the ways in which people experience urban heritage in their everyday lives. To this end, I use a media studies perspective to contribute to the emerging literature on historic urban landscapes. In 2011, UNESCO adopted the Recommendation on the Historic Urban landscape. In this new approach to urban heritage, there is a growing attention to the ways in which urban communities give shape to the historic layering of urban landscapes. Furthermore, this approach seeks to actively involve citizens in urban conservation. My project demonstrates how participatory heritage websites can be used to achieve this objective. This project was funded by the The Netherlands Organisation for Scientific Research (NOW, as part of the KIEM programme. This funding schema aims to encourage and facilitate public-private partnerships in the domain of the Creative industries. Partners in this project were Het Nieuwe Instituut and the DEN Foundation (knowledge centre for digital culture). Van der Hoeven, A. (2018). 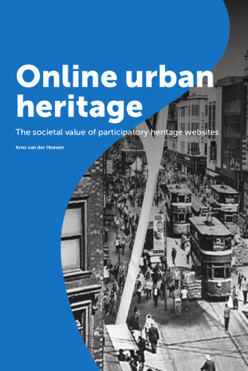 Online Urban Heritage: The Societal value of participatory heritage websites. Rotterdam: Erasmus Research Centre for Media, Communication and Culture. Van der Hoeven, A. (2019). Historic urban landscapes on social media: The contributions of online narrative practices to urban heritage conservation. City, Culture and Society, prepublished on 11 January 2019. Van der Hoeven, A. (2019). Networked practices of intangible urban heritage: the changing public role of Dutch heritage professionals. The International Journal of Cultural Policy, 25(2), 232-245. Van der Hoeven, A. (2018). Valuing urban heritage through participatory heritage websites: Citizen perceptions of historic urban landscapes. Space and Culture, prepublished on 30 August 2018. Van der Hoeven, A. (2018). Gedeeld stedelijk erfgoed toegankelijk maken vóór en mét burgers. DEN (blog post). Van der Hoeven, A. (2016). Verslag Studiemiddag digitaal herinneren in de stad. Erfgoed 2.0 (blog post). Van der Hoeven, A. (2016). Het levend erfgoed van Rotterdam. Puntkomma, 10, 20-22. Van der Hoeven, A. (2014). Interactieve verhalen in Amsterdam-Oost. Sociologie Magazine, 22(4), 18-20. Copyright © 2019 Arno van der Hoeven. Powered by WordPress. Theme: Spacious by ThemeGrill.